9:00 A.M. 2 mile Scamper. 9:30 A.M. 10K Trail Run. For anyone who completes the 10K course faster than the race director and his dog Ruby, he will buy you lunch and a beverage at Joey B's after the race. The purpose of the event is to create a greater awareness in the community of the extraordinary trail system that exists locally and do so in a way that is consistent with the mission of the Nature Center. 1. Limit size of the field to the first 200 entrants to reduce the impact on the trails. 2. 100% paperless online registration through Active.com. 3. Water bottles with wrist straps instead of water stops. 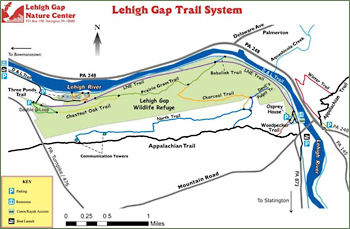 The Eighth annual Lehigh Gap Nature Center More or Less a 10K Trail Run will be back to the fast course with a start and finish at the Lehigh Gap Nature Center. This loop course offers the most single track of any of our prior course variations. We will be returning to the top of the gap in 2019. The race enjoyed a record number of participants in 2018 and I look forward to seeing how we can continue to grow this awesome trail run at the beautiful and nationally recognized Lehigh Gap Nature Center. This year’s course also features the notorious climb up the Bobolink trail. Two of the course director’s favorite sections of the trail system are featured in this year’s course. They are a spectacular view of the Lehigh River on the Chestnut Oak Trail and the western end of the Prairie Grass trail. The technical course features a variety of terrains from rails to trails, single track and open fields with beautiful views of the Lehigh River and the North face of the Blue Mountain. Be sure to check out the course map at www.lgnc10k.com. The 2.3 mile Scamper has terrain suitable for family members of all ages and ability levels and still includes the short but challenging Bobolink Trail. 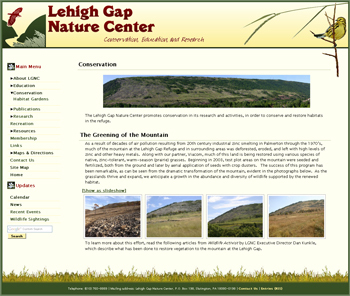 All proceeds from the event help to support the nationally recognized Lehigh Gap Nature Center. Be advised that sections of the course are technical, rocky and steep. For more detailed course information, please check out the course page which contains a downloadable map and GPS waypoints. 2mile course-mixed surface with portions of Rails to Trails paths. Includes 2 short steep hills and a single section of single track trail. Awards will be given to the top overall male and female runner in both the 10K and the 2mile Scamper. 18 and under; 19-29; 30-39; 40-49; 50-59; 60 & up.